We at The Smooth Criminals know that anyone planning a corporate function has enough on their plate without having to worry about organising the band. We can call upon on our years of experience as a professional function band to ensure everything runs smoothly. Whether it's a Christmas Party, Annual Ball, Staff celebration or Corporate Function we've got it covered. We offer free unbiased advice as well as being happy to liaise with venues, event organisers, AV companies and other entertainers. We know that good communication can be key to a successful event. We can help by offering extra entertainment services such as DJ’s and live dining music, we also have many contacts for a whole host of other recommended entertainers. This way we can minimise space usage and organise the transitions between acts smoothly and efficiently. This considerably reduces set up times and floor space requirements as well as eliminating any technical issues. Are there any noise restrictions or sound limiters? How accessible is the stage area? How much space does the band need to set up in? Does the band provide a full lighting rig to light the dance floor as well as the stage area? The Smooth Criminals have experience working with sound limiters and noise restrictions. The acoustic sound of the drums is often the loudest instrument on stage, this why we have the option to use state of the art Roland electric drums where required for no extra fee. This means the total sound of the band can be adjusted just as you would your hifi, meaning that the perfect volume can be achieved. We also work with venue staff to ensure that we understand and meet their guidelines as well as discuss possible arrangements to overcome any venue problems and access restrictions. 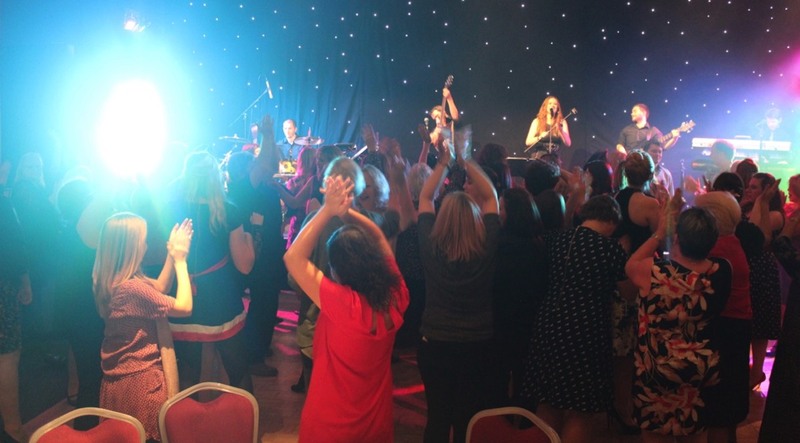 The Smooth Criminals can provide a suitable PA & lighting rig to meet the requirements of most venues. Inevitably, the amount of musicians and size of the PA will largely dictate the total amount of floor space required to stage. We're alway happy for our radio mics to be used for speeches and hosting throughout the evening. We can of course provide recorded music whenever needed even if you haven't booked our DJ services. What time should we get the band onstage? We always fine that the bands performances have more impact when guests are given time after arriving to chat and have a few drinks. If your guests arrive at 7.30pm and the evening finishes as midnight then we’d recommend getting the band on around 8.30 - 9.30pm then 10.30 - 11.30 or 11 - 12, depending how you want to finish the evening. If you've booked a DJ they can nicely warm the audience before the band to really start with a bang! This means everyone gets to have a good chat at the start of the evening then get some drinks down them and start dancing! It's also a good idea to avoid the band performing while the buffet is being served or consumed. We'll always happily advise on your timings to help you get the best out of the evenings entertainment. Our versatile band options offer an extensive repertoire, offering in many hours of live material and comprising of a versatile mix of soul, funk, disco, rock, modern pop, blues, jazz and swing classics. We can tailor our repertoire to suit most ages and clientele, we can also change our set list on the fly to suit your guests and ensure they keep dancing all night long! We'll always wear smart dress to fit in with your guests. Male band members will usually wear grey suits with white or black shirts and female band members will wear a dress as seen in our band pictures. If it’s a formal event we can wear dinner jackets with bow ties. Female band members will wear a smart evening dress. How much space does the band need to set up? Do they require a raised stage? What are their power requirements? When planning the room layout it’s always a good idea to leave space between the band and the tables, as no one wants to have a speaker positioned inches away from their ear hole! Many of our clients have their evening meal in the same room as the evening entertainment. In this situation it’s always a good idea to remove some of the tables from the area in front of the band to create a dance floor area - 8ft by 8ft is a good minimum size. The Smooth Criminals floor space requirements are highly flexible, as we can arrange our equipment to suit most sized stages or floor spaces. As a fully live band with full drum kit, guitar, bass, keyboards, monitoring and lighting rig, we will require approximately 10 x15ft of floor space as well at least 2x twin mains power sockets. We generally use up to 18amps for larger events, although 16amps is fine for smaller events. However, as we have a modular PA, we can add or downscale equipment to suit the venue. Larger venues (with in excess of 350 guests) will require more equipment and as such more floor space. Please note, the Smooth Criminals do not require raised staging, a flat floor area will do just fine! Many venues require the artist to have Public Liability Insurance and to have been recently PAT tested. This is especially important when large amounts of alcohol and partying is involved! Many bands try and get away with having individual Public Liability Insurance but this only covers the individual and not the whole band. The Smooth Criminals carry full band PLI insurance to the tune of £5,000,000 and all our equipment is thoroughly PAT tested ensuring everything is as safe as possible. We want you to be completely happy with our services and have piece of mind when booking us. If you choose to go ahead with a booking we’ll draw up a professional contract for our services, then request a small deposit to secure our services. We usually ask for the remaining payment a week in advance or even on the night. We're based in Birmingham, West Midlands but cover the whole country. We're even available for performances abroad! We're completely self contained so can perform anywhere (within reason!). We regularly play in: Birmingham, Sutton Coldfield, Solihull, Lichfield, Nottingham, Leicester, Worcester, Oxford, London, Brighton, Derby, Stafford, Manchester & Liverpool. In the past we've even travelled to The Isle of Wight and as far North as Dumfries! We're always happy to discuss your requirements with you in person. Simply email us at smoothcriminals@live.co.uk and we’ll will respond to your inquiry within 24hrs. For a more immediate response, we can also be contacted by phone – 07962 444 574.